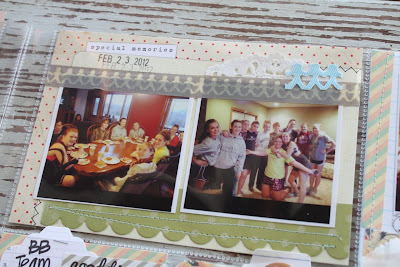 Today I'm sharing Week 8 of my 2012 Project Life. 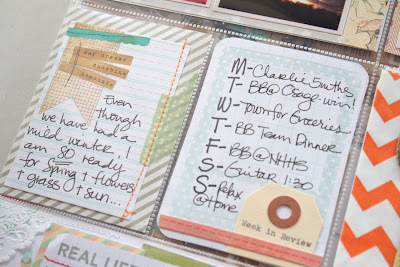 A pretty ordinary week for us...wishing for spring, sweet Charlie, grocery shopping, meal planning, a BB team dinner, big shop update. Something new...lots of new baby calves over at the farm. This week I just went with the flow on my pages. I picked out embellishments simply because they were laying out on my desk, or maybe they were new items added to my stash. I'm finding that my time to work on my PL pages is getting choppy. I don't have time to devote the 2-3 hours it takes to complete my pages all at one sitting. So I dabble. I work on a few inserts at a time here and there. 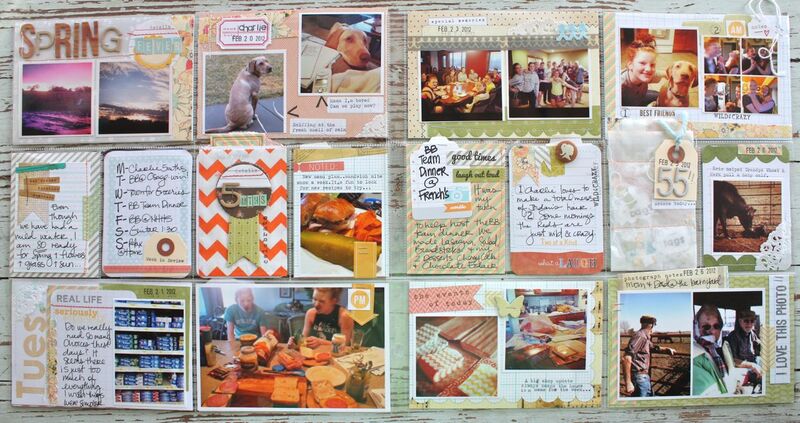 Which is perfect because I treated each one as it's own little scrapbook layout....not really worry about if it matched the rest of the inserts or not. Here's my main dated insert...which I just realize that I forgot to add dates to many of my inserts but I will remedy that soon. This one features the rain & the sunshine. Lots of missing letters from my alphabet stash so I'm mixing and matching now. You'll notice lots of little embellishments from recent kits in my shop. I'll try to point those out so that those of you who purchased my kits can see some samples in action. The details circle with stitching is one of those accents with stickers on top. The floral paper is from a discontinued Sassafras line. Some of my favorite papers ever from this collection. A few photos of Charlie who is 5 months in these photos. Label with stamped name is from a recent shop kit. 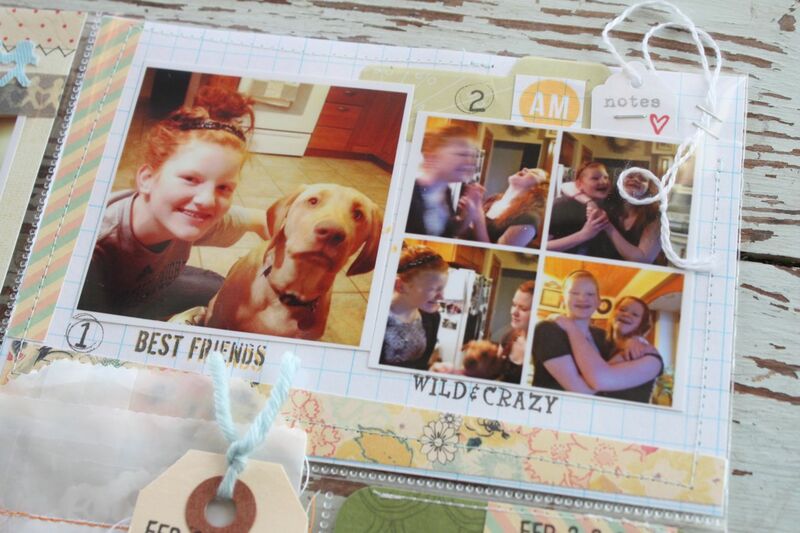 Grid labels are my own creation. A bazillion kinds of toothpaste. Really? Do we need so much of everything? Just an observation from a recent Walmart trip. 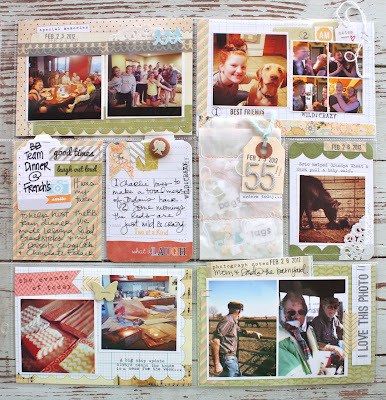 Base 4 x 6 card is a shop kit item made with Jenni Bowlin's days of the week stamp. Journaling is on shop kit item which is a PL card with Studio Calico "real life" stamp. A few paper scraps, a portion of a doily and stitching finish off this insert. 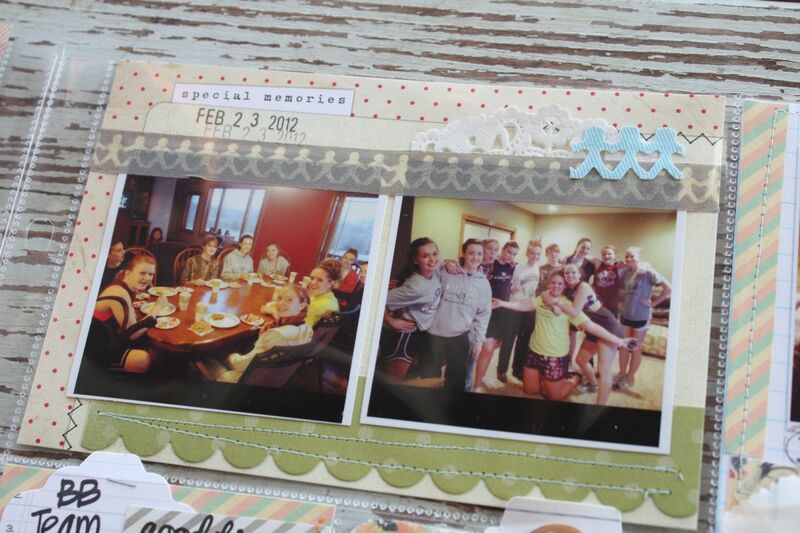 Basketball team dinner for the high school girls featuring Washi tape, Amy Tangerine people sticker, portion of a doily, scalloped paper cut with Papertrey medium scallop die, Elle's Studio insert card + machine stitching. 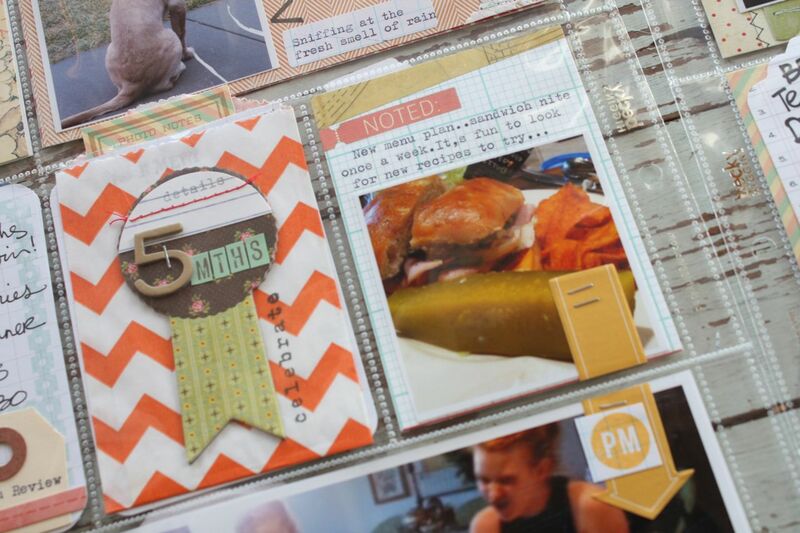 Grid paper base insert with scraps of patterned paper, a Studio Calico sticky note + small stamped tag from a recent shop kit. 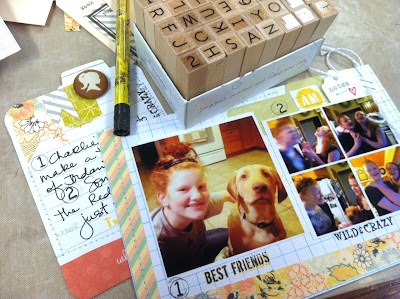 The "AM" round stamp is from Studio Calico. 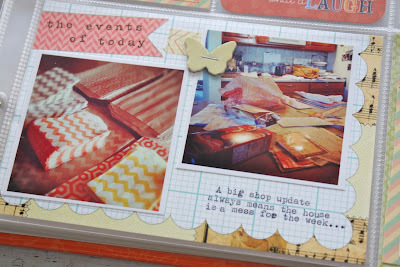 Photos from a recent shop update + the mess that always follows in the rest of the house. 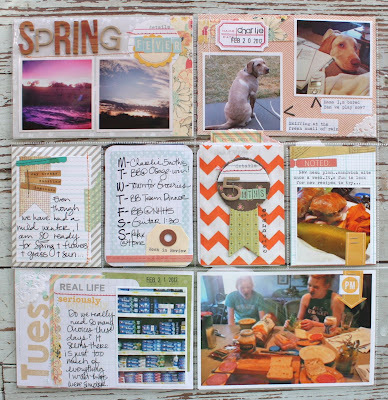 An Elle's Studio base card was so easy to use. Just a little Washi tape + a Studio Calico chipboard butterfly was added. 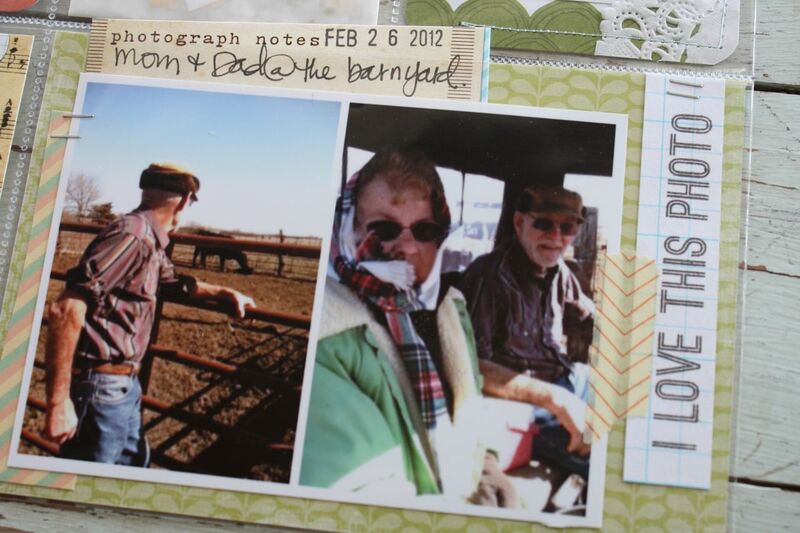 A few shots of my parents right after delivering a newborn calf. I always love when I can snap a few shots of our parents. 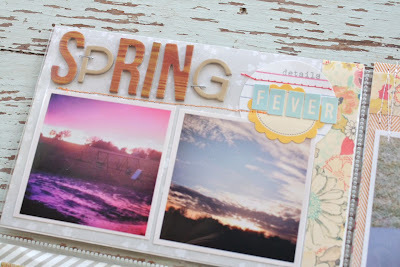 Stamp is from Studio Calico, journaling tag from Elle's Studio + a little Washi tape. 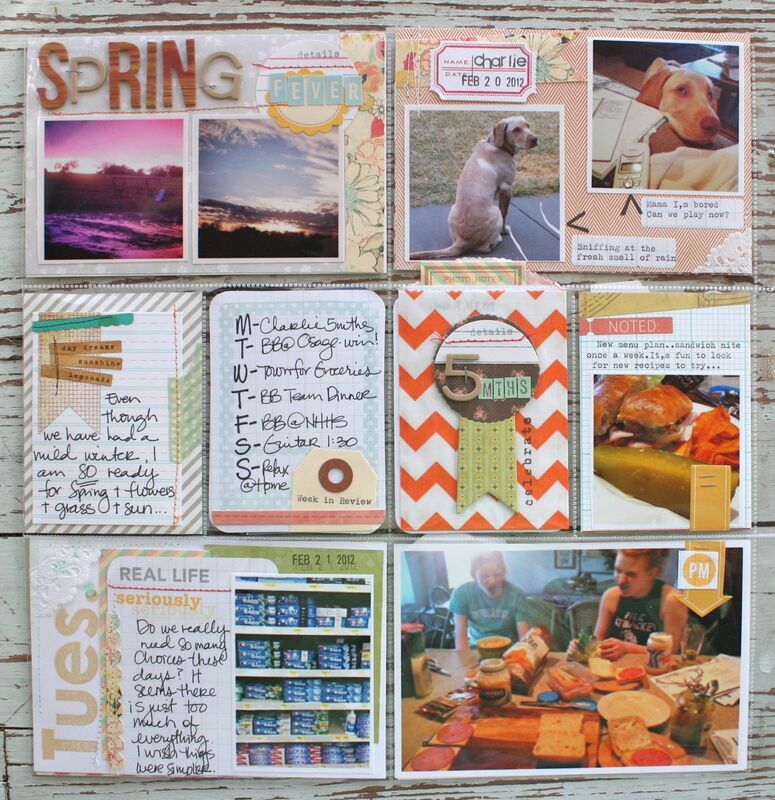 And here are my 3 x 4 journaling inserts. On the left I used an Elle's Studio piece layered onto some patterned paper + some Washi tape & machine stitching. On the right I created a Week in Review card using a Studio Calico stamp + shop item created with a small manila tag. 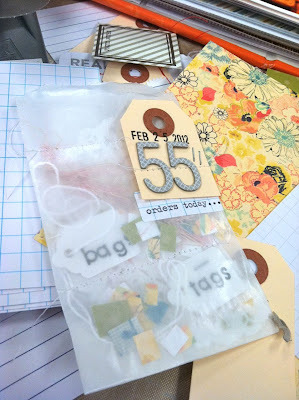 I've really been experiment with cutting the tags down and using them in different ways. 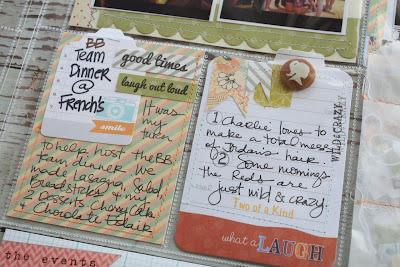 I love to use my Bic Markits to create bolder words/letters. Very quick and easy. 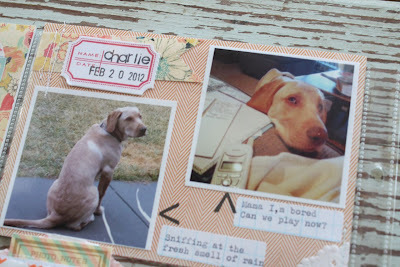 Here I used a small orange chevron sack (currently sold out) to hold some journaling about what Charlie's doing at 5 months old. I love the little sacks and that all the small sizes in my shop fit into the 3 x 4 slots. No trimming necessary. And a tip: if you want to use the sack on the left side of the regular page protectors, simply cut the top of the slot open with an xacto knife. That way you can access the slot opening from the left side. On the outside of my sack I used a chipboard piece embellished with shop kit, chipboard letter and small sticker letters. 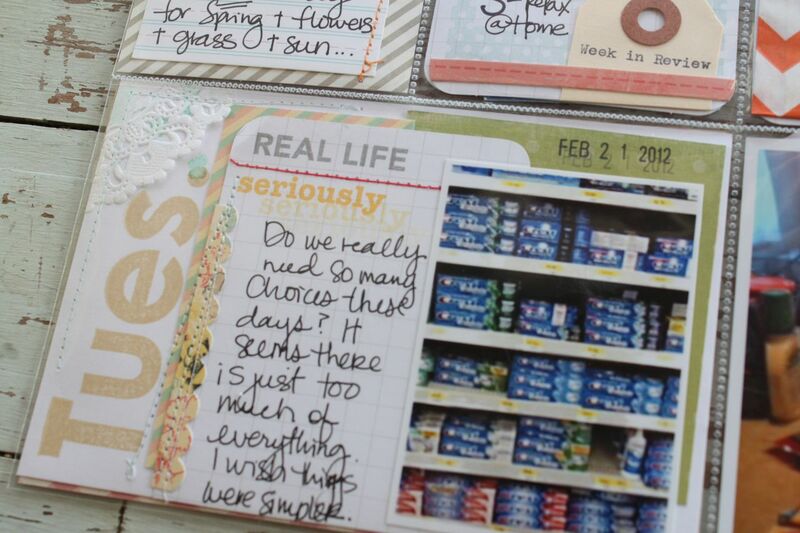 2 more journaling cards. On the left I used a new Banana Fish Studio printed tag (awesome) + some stamped Studio Calico words. On the right I used a Project Life journaling card embellished with some hand cut flags, Washi tape and the cute brad with ponytail girl. 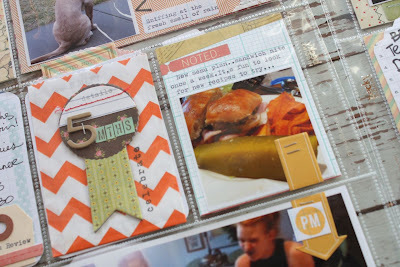 Here I made a fun confetti sack insert (see below for more details) + an insert made with a Cobalt Project Life journaling card. A few fun techniques this month. First I created a confetti sack inspired by Lisa Truesdell. She's the queen of confetti and just makes you wanna try it out. My confetti is square though, not circles. 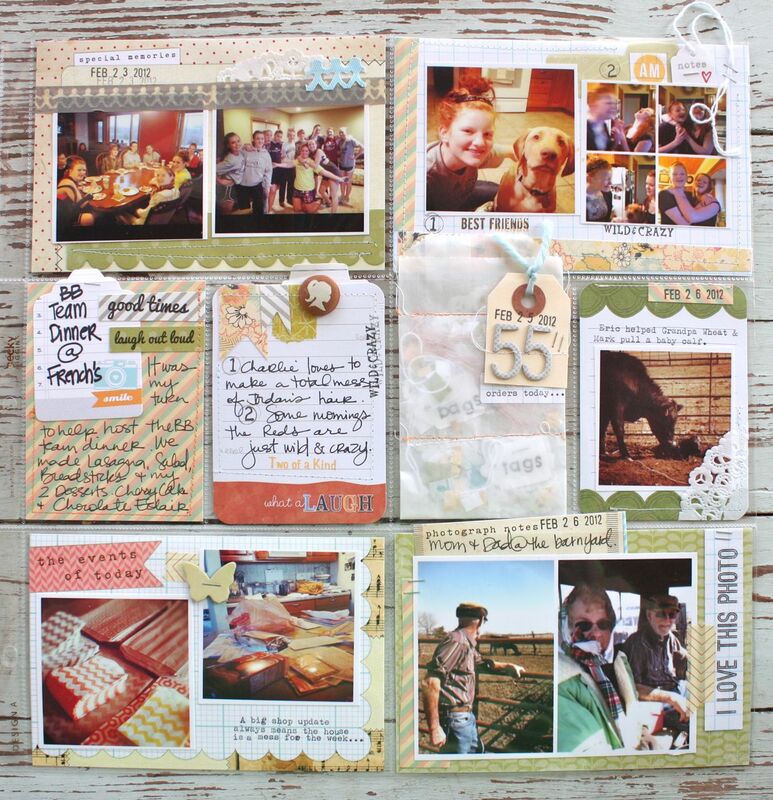 It was so easy to just take some strips of scrap patterned paper and snip some squares. If you zoom in close you can see a few more tidbits in the glassine sack too. I stamped a few small white tags with "bags" and "tags" to correspond with items I sold during my last shop update. I also tucked in half a paper doily + some snippets of yarns that I sold too. A little time capsule of my shop goodies. I ended up stitching 2 orange horizontal rows across my sack, filling each section then stitching off. Fun, fun! On top of the sack is small manila tag with chipboard letters and the date stamp. 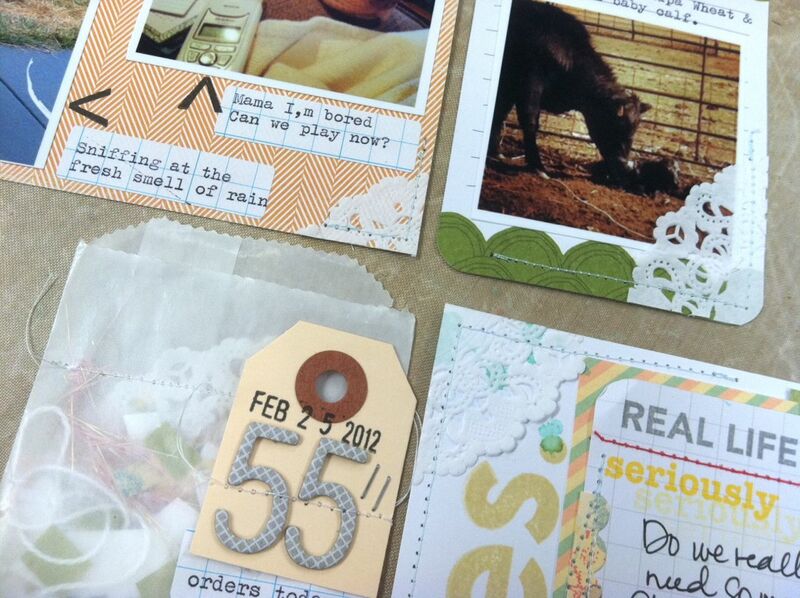 Here I used a doily which I include in lots of shop kits on a few inserts this week. Instead of using a full circle I snipped little wedges of out the doily in pie shape fashion. Wherever I wanted a little *something* I just stitched on a portion of the doily. And here was a fun way to connect my journaling card with it's corresponding insert card with photos. I numbered my photos 1 & 2 with little circles around them. On my journaling card I have the same 1 & 2 numbers with circles. The numbers are from Hero Arts tiny wood alphabet stamps. To make the circles that are very, very thin lined I used a new tool that I'm keeping in my stash. It's a regular lead pencil with the eraser taken out. 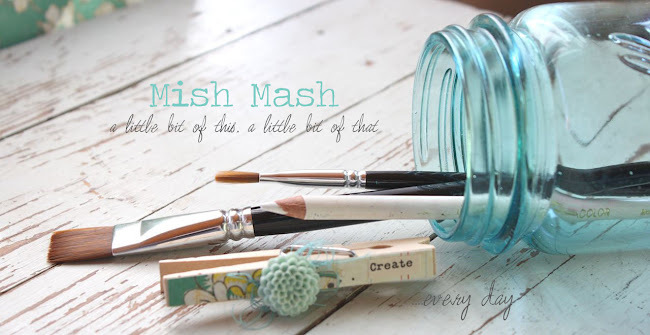 The metal rim that is left makes a perfect little circle stamp. Just press it in ink and stamp. And now....the aftermath of a week of Project Life. A happy little mess. 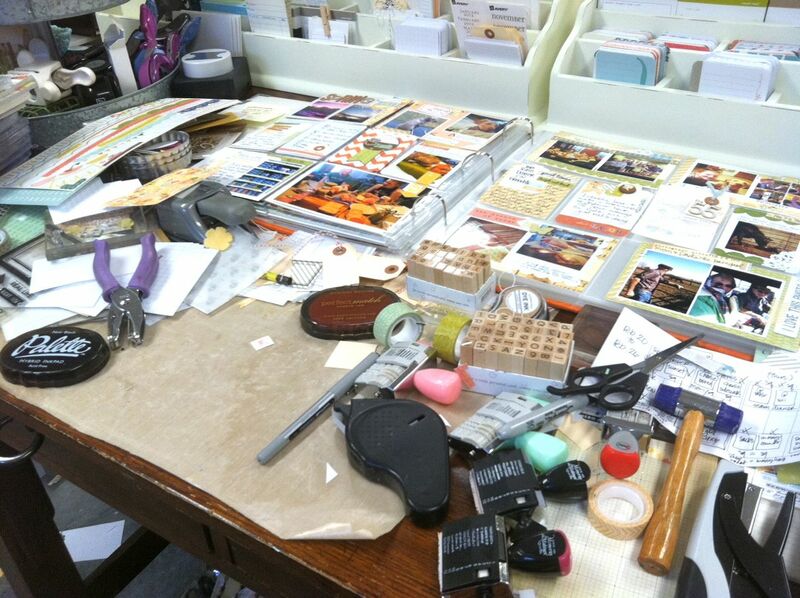 I clean this up each time before I start a new week of PL or crafty project. I guess I better get on it because I have lots of assignments to work on. I'm expecting a big parcel today full of fun new goodies for the shop. Look for an update possibly tomorrow or Friday, depending on how fast I can get the items photographed and up in the shop. 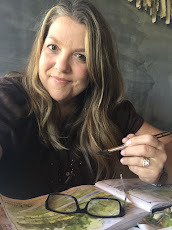 I'll be tweeting and posting an update here on the blog. Thanks for hanging out here a bit today! Have a great rest of the day. You're so good with the details. 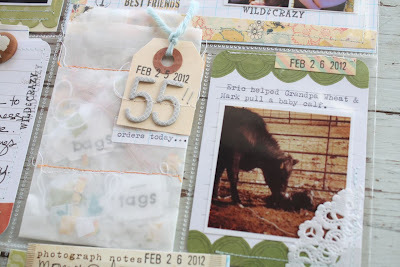 I'm a big fan of all of the little tags and LOVE that confetti sack! Another awesome week! Love it. I shal be stalking for the new shop updates :) Love using your goodies for my PL & mini's I've been working on. 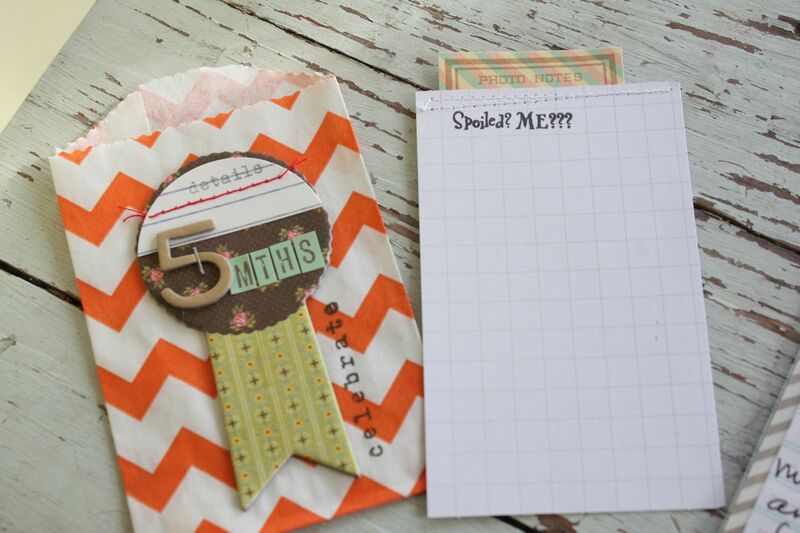 I was so happy to see that you had the grid labels in stock in your shop. I placed an order this afternoon and look forward to trying them out! 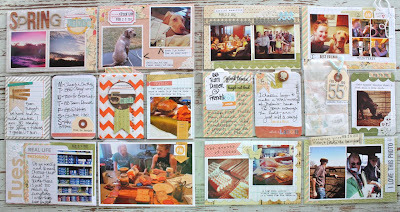 Michelle, I always love seeing what you've done with your photos of the week! It's beautiful! I can really appreciate all the work you've put into it. As a side note, I'm a Midwestern girl now living in south Florida. I'd really love to see those new baby calves! ;) Hope you have a good week. I was very happy to have found this site. I wanted to thank you for this excellent information! I have no doubt like a little and I have saved your blog to make sure you write something new on the road.